It’s always an interesting procession at the end of the movie to watch people rise from their seats almost immediately after “The End” splashes on the screen. They miss the credits – the people who made the movie happen. Maybe it’s just me, but I watch the credits. It’s intriguing to watch who the ‘grips’ there were and who did provided the catering. Just who was the “Man at the gas station”? Who provided the wedding cake? There’s an application here for me to live. 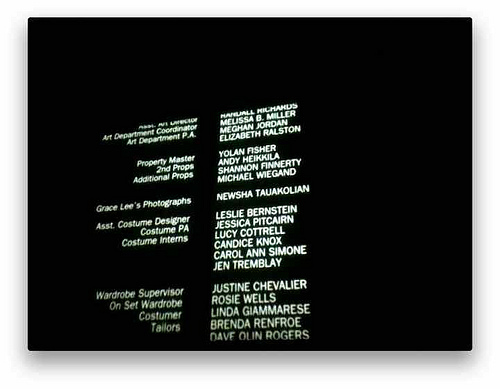 I shouldn’t just pay attention to the credits at the movie theater — I need to pay attention to credits everywhere else. At my job, I am quick to scoop up the project or the article or the report and start moving on it. But I don’t read the credits – giving praise to the work of the hands that produced it. And at home, I haven’t always been one to give credit, as I’ve been much more apt to give criticism. How about the man who sweeps the parking lot at my work, or the woman who cleans the glass. How about the older gentleman who picks up trash in the neighborhood or the single man that stuffs the bulletins at church. Let the credits roll. Who do you need to praise today? Comment here. This entry was posted in credits roll, giving credit, movies. Bookmark the permalink. I like this, David. My dad has always waited through the credits, wanting to know the name of the gaffer or the best boy — and has the kind of memory that could tell you if the same fella was involved in the production of another file. I'm always kind of impressed that films still even include the credits so far down the chain.But this is a good reminder for me in life as well. I'm an independent contractor now, working from my kitchen or basement office with no secretarial staff to handle my correspondence or copying or what have you. It reminds me that these folks serve us well and a little appreciation goes a long way. There is One who will give credits at the end to all. He will miss nothing.I'm grateful. What a great analogy! This is one of the simplest things we can do to impact the lives of others (giving credit, saying thank you, acknowledging people), but we are so quick to jump up and move on. In my company we are working hard at "employee engagement" (I know, trendy management buzzword, and one of the things we keep telling supervisors and manaagers is that the one thing people want more than anything else at work is to feel appreciated. Those two words, "Thank You" are so simple, but can make a huge difference in how people feel about their jobs. But really, I don't know if I will ever actually sit through the credits after a movie and read it all!